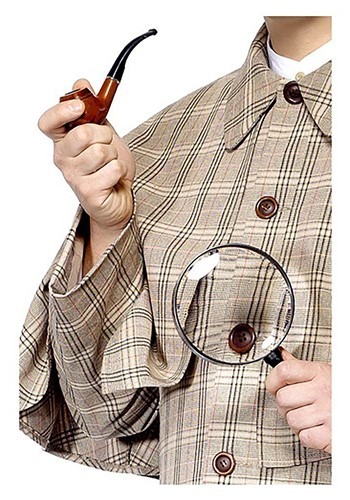 How is your sleuthing game? Are you able to ascertain the hidden nuances of a crime scene with just a quick gander? Do you have the godly perception that makes criminals shake in terror at your mere involvement in the case? If so, that’s pretty impressive. They should write books about you! But, even if your forensic talents are out of this world, it is still helpful to make sure that you’ve got all the tools of the trade at the ready. Who knows when you’ll be dealing with your grand nemesis who is just as good at hiding details as you are at finding them! In order to ensure that you have the best chances at solving the crimes, we suggest that you do not go anywhere without this Sherlock Holmes Accessory Kit. Aptly named, the kit includes a working magnifying glass and the detective’s own famous black stemmed pipe and wood-grain bowl. Now, this is likely all you need to really solve the issues, but it wouldn’t hurt to go the full nine yards and equip yourself in the full Sherlockian Scottish Yard Garb! Though, you might end up attracting your Moriarty even faster that way. But, think of the adventure! Used the magnifying glass for my Velma costume.